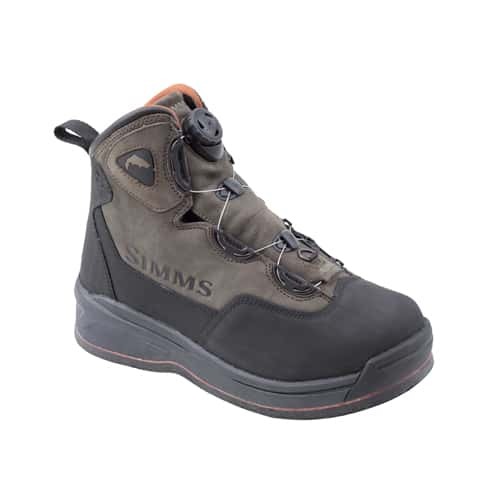 The Simms Headwaters Boa Felt Sole Fly-Fishing Boot is a very innovative and feature-rich Simms fly-fishing boot that features a 12mm felt outsole and and a dual density midsole for shock absorption. This fly-fishing boot also utilizes the ESS plates for improved cleat retention and proprioception. The Simms Headwaters Boa Felt Sole Fly-Fishing Boot features a Boa closure system for a precise, fast on and off performance, on-demand fit that is extremely comfortable and is constructed with waterproof nubuck leather with a full scratch rubber rand. The Simms Headwaters Boa Felt Sole Fly-Fishing Boot is a very innovative, comfortable, high quality fly-fishing boot that should definitely be worn during your next fly-fishing adventure, so make sure to check out this Simms Headwaters Boa Felt Sole Fly-Fishing Boot today from the Platte River Fly Shop. Gary Hammerslag's initial inspiration for the company was the creation of laces for footwear that would stay tied and not come undone during physical activity. In 2001 the first boot-systems featuring the Boa laces were produced by Vans and K2's snowboard divisions. In 2002 DC implemented the laces into its boot-systems for snowboard boots as well. By 2004 the company moved into the cycling industry, and next into the golf industry in 2005. The lace closure systems were also integrated into other products, including trail running shoes and more general outdoor footwear. This included winter boots, hiking boots, hunting boots, and work boots. Boa has also been used by endorsed athletes in both the Olympic Games and the X-Games. In 2011 Simms Boa Technology changed the name of its patented closure system from the "Simms Boa Lacing System" to the "Simms Boa Closure System", in reaction to the use of Boa Technology on non-footwear items such as helmets, motorcycle gloves, hydration packs, medical braces, and other apparel. By 2012 Boa Technology was used in one third of all the snowboard boots produced globally, and more than 70 riders in the Tour de France used the Boa Closure System.